When you score Illicit Sales, you may take 1 bad publicity. Gain 3credit for each bad publicity that you have. "Anything, to anyone...for the right price." 1 bad publicity = 1 free credit for the runner to spend during each run. Therefore after 3 runs at 1 bad publicity the runner will have saved 3. The only way that math doesn't apply is if the runner doesn't use all the credits during a run. That generally means your ice is weak and you don't have anything interesting to trash (bad publicity credits can be used to trash assets during a run). Or, if you're overdoing it, you could have much bad publicity that the runner gets completely free runs through heavy ice and still have credits left. In any other case every run you effectively give the runner a credit. 3 runs isn't that much in the grand scheme of things so if score Illicit Sales it quickly becomes more of a money maker for the runner than for you. On the other hand due to how bad publicity works the runner doesn't get that money into their savings account. That means they don't have it available if you decide to throw in a little Midseason Replacements. 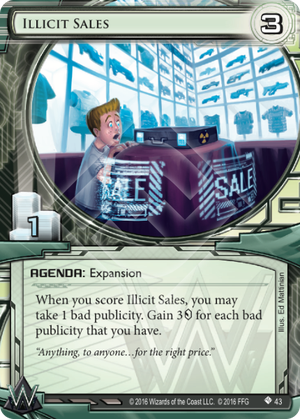 Illicit Sales is good in a "get rich and kill the runner" deck, e.g. with GRNDL: Power Unleashed. However being a 3/1 it's not as good as Hostile Takeover since you can't score it out of hand. Also it needs to be scored with 2 bad pub already present to gain more credits than Hostile Takeover. I don't see much of a case for Illicit Sales given the competition. The only way Illicit Sales would shine is in a deck which racks up massive amounts of bad publicity over a longer period of time, but I simply don't see that working given the economics. I can't wait to try this card out in the outfit, that ID looks like it will stack BP and this could pay off big. Even scored on empty you get 6 credits in that ID. 5Kidz has the newest and most amazing gear for you! Do you want to make all your friends jealous? Would you like to maybe leverage your privileged position at the top of the social ladder to cause some atrocities? We thought so. Thanks to your Daddy's hard work at GRNDL, we're happy to offer you a fantastic deal on the 5KIDZ PROPRIETARY NUCLEAR ARMAMENT for the low, low, low, low price of 3 per exposé that Daddy's been in lately! Why not get him a Father's Day gift, so he can make the bad guys go BOOM! Remember, little Timmy, family is everything. The bad people that Daddy fights every day are trying to tear you apart. What about Mommy? She works hard as well, making new homes for the people of SanSan! Why not get her a present of the 5KIDZ SUITCASE OF FUN so her job becomes a little easier? After all, doing good works costs money, and the 5KIDZ SALE is just the thing to bring in the cash money! What are you waiting for? WHAT ARE YOU WAITING FOR?! Targeted advertisement paid for by 5Kidz Entertainment Ltd. 5Kids Entertainment is a wholly owned and operated subsidiary of the Weyland Consortium.